Sitting here, alone, in my sparsely furnished two-by-four room, scratching my life-affirming sentient mind in feeble attempt to conjure a unique, though provoking line of expression that would merit expansion beyond a simple page; significant to the pulse of the day as to garner the increasingly precious idle moments of perspective readers knowing full-well the level of competition imposed by like-minded, sentient scribes, equally motivated to infuse their seemingly unique style upon the world stage of celebrated authors past, present and future; yet knowing full well the potential of such, rivals the ability to fly unheeded by the force thrust of rocket engines or the simple adjunct of the wind propelling propeller attached to the top of a benny-cap of old; now imposes a sense of dread spawned by the true knowing that achieving such a lofty goal, as levelled within this introductory text, stands increasingly less probability to materialize as to render any further energy of mind transformed into words; wasted. The tentacles of endeavor that connote my purpose for being are withering and dying from interest receding. rendering this creative life increasingly redundant. before totally atrophying this unseen energy, mental force? lack any essence of wisdom to stimulate words of worth or inspiring. into oblivion, I feel consigned and obliged to descend. So take this reward, this last motif of expression, though be it lame, no longer am I able, toward any literary fame, strive to ascend. 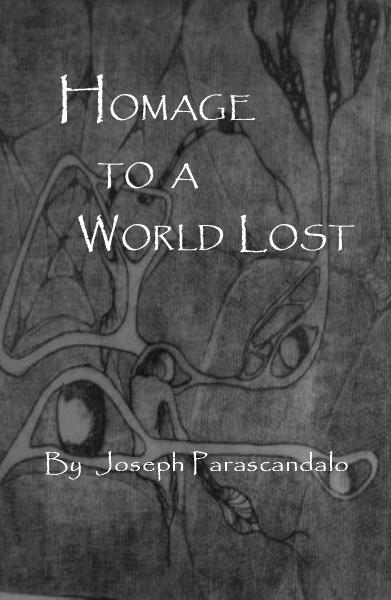 Encountering one of my earliest published works online gave pause to what I wrote and subsequently self-published under the title: HOMAGE TO A WORLD LOST . Contained within this book, debut 2010, are poems reflective of the tumultuous first decade of this 21st Century. The reading of many of the poems clearly echoes, in a prophetic way, what is being experienced around the globe presently namely; the seeming collapse of effective governance and the politics it embodies; the run-away state of sectarian and religious terrorism throughout the globe; and, the extremes of climate change driven by global warming to name but a few of the subjects addressed. Here is your chance to freely read some or all of the 133 pages contained therein and, for yourself, to draw your own conclusions about the state of a WORLD LOST! Not a choice everyone is capable consuming. Security to reason demanding ongoing breeding. Convolution, the mechanism most assuredly employed.